The first BK14 was a gift, but from the moment I held it in my hands, I knew I wanted one of my own. Normally I look for extreme light weight for my folding knives and fixed blades, but the BK series has a reputation for being virtually indestructible, and that’s what I was looking for with this knife–a small, last ditch survival knife that would not let me down when I needed it. My review sample was purchased from Amazon for about 35 bucks, but I also purchased the set of two scales for 15 bucks that are not included with the knife, bringing the total to about 50 bucks. I’ve owned it for about a year, and I’ve become really attached to it in that time. This is a small, fixed blade knife, which is a product of the collaboration between Ka-Bar, Becker and ESEE. It’s basically a Necker neck knife blade with the Izula handle– the best of both worlds. The BK14 Eskabar is made in the USA from a single chunk of 1095 Cro-Van steel. The entire knife is powder coated in black. The BK14 can fill the role of a neck knife for self defense, camp knife, EDC knife, or for survival. 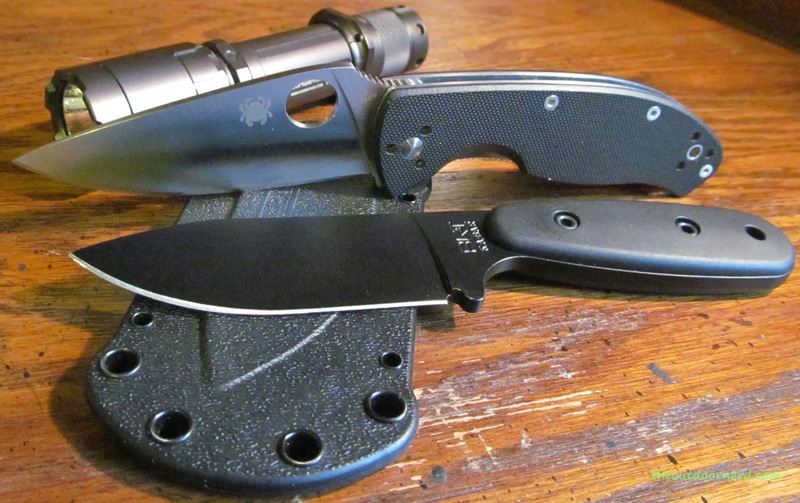 Ka-Bar offers a two pack of very nice Zytel scales which can be purchased separately. I ordered these with the BK14 and mounted the black scales to mine. Some folks will want to forgo the scales and do their own para-cord wrap, or leave the knife as-is to save on weight. Note that the scale set includes two sets of screws, so you could actually use the set for two knives. Saving on weight makes sense, because this is a fairly heavy knife for its size. If you want a knife that doesn’t skimp on good quality steel, weight is the price you will pay. The recipient of the first BK14 told me that it was too heavy for backpacking and that she wasn’t going to use it much because it was so heavy. Of course, she declined to give it back, saying that it looked too well built to part with, which leads me to my second impression. This is a robust knife, and the blade is thick! It’s not pretty looking, or particularly sleek. The Becker blade has a big belly. It’s actually a little ugly for a fixed blade knife. But holding in my hand, I not only get the impression I could easily baton firewood with it, I get the impression I could baton lesser knives with it. I get the impression that I would have a very hard time even purposely destroying it. Made in USA knives generally come at a price premium, and usually (but not always) with good reason. They usually have a better built quality and a drastically better steel quality. So in the case of a knife like this, the build quality is hard to see, because it lies in the build quality of the steel and its heat treatment. The heat treatment on a knife is an intangible thing until the knife breaks, cracks or shatters. While the Chinese are getting better about heat treating their steel, even the good factories can be hit and miss. With the BK series there are no such worries. It’s interesting that the BK series are budget knives, because they are so well built and have such a great reputation in the bush. The blade is made of 1095 Chrome Vanadium steel and features a full flat grind with a drop point. Like the rest of the knife, it is powder coated black. It has lots of belly, which I like in a knife like this. The extra belly does give a knife a little more heft, but it also makes it much more versatile in my opinion. Note that this is the exact same blade as on the Becker Necker knife, except that it has the Izula handle. A stroke of brilliance by Ka-Bar to combine the two. If you are looking for a slightly smaller blade, the Izula is probably your best choice. The blade shape and drop point are pretty much ideal for what I want in a camp/survival knife. I’m also a big fan of full flat grind (FFG) blades, since I’m such a Spyderco fanboy. The BK14 has the same handle as the Izula. It’s hollowed out to save on weight. It almost looks a little flimsy in the photos, but it’s definitely not flimsy. Most people will want to wrap this in paracord to save on weight, but I bought the optional Ka-Bar scale set because I can barely tie my own shoes. Where the knife itself is a high quality marvel made in the USA, the sheath … not so much. The sheath has a tendency to dull the blade unless you draw it pressing the spine of the knife against the sheath so the blade doesn’t rub as much. Some reviews have mentioned putting a piece of lanyard cord in the sheath to stop it from rubbing on the blade, so that may be a solution. For belt carry, the sheath needs the Tek-Lok adapter, which I did not buy. By the time I realized I missed not having the Tek-Lok, I was already used to carrying the whole knife in my front jeans pocket. My thought is that if they are going to make a mediocre sheath, at least include the belt carry adapter. And don’t get me wrong, it’s not a terrible sheath. It does hold the knife snug, and the build quality is decent. It’s more disappointing because the BK14 is such a great knife not to have a great sheath. But that’s OK. Soon I am going to try to make a few Kydex sheaths, and this will be one of the first ones I try. The reputation of durability for the BK line is well deserved in my opinion. I have beaten the snot out of this knife and it just shrugs it off. I even spent a day with my son in law using my BK14 for throwing practice. His Chinese knife broke after a couple hits on a tree, so he had to use my Eskabar after that and it got twice the abuse. It put a few good scratches in the powder coating and even a tiny nick in the edge, but it held up well overall and had no damage to the tip–a testament to its heat treatment. The BK14 has been on a couple camping trips and done well as a camp knife, and it’s never far from EDC duty. In fact, it sits on my desk right next to my new Hultafors. I can’t think of a single task that this knife is the best at. But the greatness of this knife is that it can fill so many shoes. It’s a knife, axe, shovel and pry bar all in one. It’s not ideal for any given task, but there are many tasks it is capable of. For that reason, it’s a good camp knife and a great survival knife. It’s probably a little heavy for EDC most of the time, but there are still times I carry it. Since I started drawing it away from the edge, it’s not dulling as fast, which is good. The handle scales in the 2-pack from ka-bar are zytel, not g10. You are right–thank you for pointing that out. I updated the post.